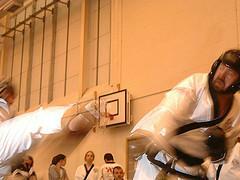 Karate belts are the way of measuring one's level or skill regarding his/her martial art capabilities. These belts signify if one is a beginner in this discipline, a moderate student or an advanced martial art expert. However, the colors of karate belts and their usage are not universal. Namely, different karate associations use different color organization and hierarchy in this respect. In karate, the colors start from the brightest, signifying the lowest level, advancing to the darkest, which is the official marking for the highest level. Starting from white, karate belts gradually advance to yellow, orange, green, blue, purple, brown and black. There are some alterations regarding these markings when it comes to Taekwondo where the belt system starts with white, moving over yellow, green, blue and red, only to reach black. Brazilian Jiu-Jitsu advances from white belt to blue, purple, brown black and finally red when it comes to adults, while going from white to yellow, orange and, eventually, green for children. In karate, a student must achieve different levels of the brown belt, called Kyus, before he/she reaches the black belt. Then, regardless of the advancement, the belt color remains the same. However, there is another system of value implemented, measured with Dans, going from 1 to 10. Again, the ordering may vary, depending on the type of karate practiced. We have Shito Ryu, Wado Ryu, Goju Ryu and Shotokan karate types. Usually, the belt ranging progresses from white to brown, as mentioned above. Then, the students need to progress from the 3rd degree to the 1st, before he/she can deserve the black belt. Once this happens, there are 10 additional levels of black belt which signify one's dedication and skills, being higher or lower among the best. The previously mentioned alterations stand mostly for the first four colors, since some schools start with the yellow belt, proceeding to the orange and so on. Moreover, some schools place the blue belt in between the green and the purple one, the orange belt after the white one. Sometimes, students who show incredible dedication and skills, reaching the 6th Dan, get a special, red belt, being considered masters of karate. Finally, regarding the 10th Dan, it is only awarded to those who have died after practicing karate for more than 40 years, dedicating their life to improving this ancient martial art. All in all, karate is truly a majestic martial art, with many unique characteristics and a ranking system which can really make you feel worthy of it. Who want to be a bodybuilder...!